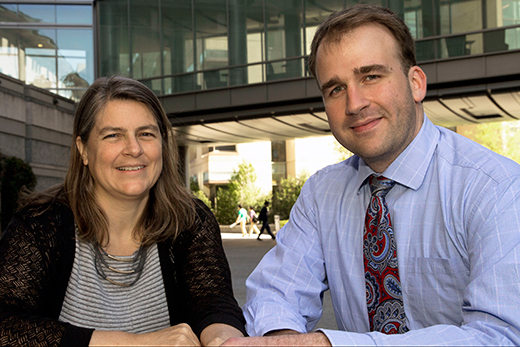 Professor Anita Corbett and PhD student Orion Keifer are the first recipients of the Eleanor Main Graduate Mentor Awards, created to showcase the importance of mentoring in graduate education. The Laney Graduate School at Emory University has announced the first recipients of the Eleanor Main Graduate Mentor Awards. The awards were established to recognize graduate faculty and graduate students who set the standard for mentorship excellence at Emory. Professor Anita Corbett will receive the Eleanor Main Graduate Faculty Mentor Award and Orion Keifer Jr. will receive the Eleanor Main Graduate Student Mentor Award. The announcement was made by Laney Graduate School Dean Lisa A. Tedesco during the annual Dean's Address to the Graduate Faculty on April 21. "We had a tremendous pool of nominations for these awards. Every nominee for both the faculty award and student award had outstanding mentoring credentials and accomplishments. The selection committee for these awards had a tough job, and I am grateful for their careful deliberations," Tedesco says. Corbett is a professor of biochemistry in the School of Medicine and co-directs the MD/PhD program. She is a graduate faculty member in the biochemistry, cell and developmental biology program and the genetics and molecular biology program in Laney's Graduate Division of Biological and Biomedical Sciences. News of her selection for the faculty award was a surprise. "I am most humbled to be selected for this award. The typical reward for mentoring is seeing trainees prosper. Anyone who is a committed mentor typically gains satisfaction from the success of others," she says. "For me, this is sufficient to make me feel as though my efforts are appreciated. However, the formal award indicating the appreciation of colleagues, friends and trainees is an outstanding validation that the time and effort dedicated makes a difference." Orion Keifer, an MD/PhD student in the neuroscience program in the Graduate Division of Biological and Biomedical Sciences, was similarly surprised. "First and foremost, I am honored to be recognized by my mentees, colleagues and mentors as someone worthy of any award," Keifer says. "I hope that it also means that I have played some small role in guiding and reaffirming my mentees as they worked diligently and exhaustively in pursuit of their goals." "The impact of Dr. Main at Emory is still felt today," Tedesco says. "She was a strong advocate for colleagues and students, and left Emory a legacy of leadership grounded in scholarship, wisdom, generosity, compassion and commitment to the values that inform and guide the work we do at the Laney Graduate School and, indeed, at Emory University." Corbett, who knew Main, agrees. "I recall serving on several university committees with Dr. Main. She was often the voice of reason ensuring focus on the topic at hand and bringing diverse constituents to a consensus. She was an amazing and generous woman. I am humbled and honored to be selected for this inaugural award honoring her dedication to mentoring," she says. Orion sees the awards as a way to highlight and change graduate mentoring culture at Emory. "To me, learning to be a great mentor is absolutely central to a career. As a mentor, you have a tremendous opportunity to help others succeed and accomplish their life goals," he says. "The idea that such training and such effort is a small undertone of graduate training needs to change. I believe that this award will place mentoring into a much needed spotlight and hopefully encourage a movement to improve mentoring training and opportunities for students." For Tedesco, the awards are a highly visible way to recognize the importance of mentoring and reward those who do it well. "Mentoring touches nearly every aspect of graduate education. It is a cornerstone of the graduate experience for both faculty and students," she says. "By celebrating those who do it well, we honor not only the mentors themselves, but the lasting imprint on their mentees who carry their experiences forward beyond Emory. We are shaping tomorrow's leaders. The value of mentorship in that process cannot be overstated." Corbett and Orion will be formally recognized as the first recipients of the Eleanor Main Graduate Mentor Awards on May 11 during the Laney Graduate School commencement ceremony for doctoral students.